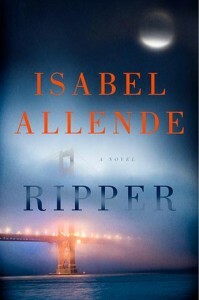 Ripper by Isabel Allende | annie's got a clue . . .
Isabel Allende. Just hearing her name conjures up ethereal, languid prose that weaves magical characters into unforgettable settings and stories. If you have not read any of her other fiction, by all means do. Check out her website for book summaries, reviews and general information about the author. Mom is still alive, but she’s going to be murdered at midnight on Good Friday,” Amanda Martín told the Deputy Chief, who didn’t even think to question the girl since she’d already proved she knew more than he and all his colleagues in Homicide put together. The woman in question was being held at an unknown location somewhere in the 7,000 square miles of the San Francisco Bay Area; if they were to find her alive, they had only a few hours and the Deputy Chief had no idea where or how to begin. the story takes place in San Francisco. The reader can catch a breathe as Allende then slows the pace to introduce earlier crimes in the sequence that lead up to Indiana’s (Amanda’s mom) capture, as well as to bring in all of the players. The kids who played Ripper were a select group of freaks and geeks from around the world who had first met up online to hunt down and destroy the mysterious Jack the Ripper, tackling obstacles and enemies along the way. As games master, Amanda was responsible for plotting these adventures, carefully bearing in mind the strengths and weaknesses of the players’ alter egos. The Ripper misfits include a boy from New Zealand who had been paralyzed in an accident and confined to a wheelchair, a shy, lonely teenager from New Jersey who only left his bedroom to go to the bathroom, a nineteen-year-old girl in Montreal who had spent much of her life in the hospital due to an eating disorder and a thirteen-year old genius with an IQ of 156. Amanda also created a character named Kabel, “a dim-witted but loyal and obedient hunchback she tasked with obeying her every whim, however ridiculous.” Amanda’s grandfather, Blake, plays Kabel. Rather than present Amanda as a one-dimensional techie, nerd, Allende exposes us to Amanda’s tender teenage underbelly. Amanda gets her heartbroken by Bradley, her “future” boyfriend who is a student at MIT. She tries a little to hard to fit in with the “cool” kids from her boarding school and gets stranded at a drug-infused rage. She awkwardly relates to her mother’s friend, Ryan Miller (a former Navy SEAL) but is perfectly in sync with Ryan’s landmine-surviving war dog, Atilla. Through each of these experiences we can not only empathize with Amanda, but are drawn closer to her as a feeling, struggling character. Allende also paints an effective picture of Indiana as a kind, emotive, loving friend and mother, but also one who is painfully blind to many of faults of those closest to her. And this shortcoming ends up costing her quite dearly. The San Francisco Bay met the dawn swathed in its usual milky fog, its outline blurred to to the world. Mist crept down over the tops of the hills like a slow-moving avalanche of cotton, dulling the water’s steely glint. It was a typical day, with several degrees’ difference between the two ends of the Golden Gate Bridge: winter in San Francisco, autumn sun a few miles north. The city’s North Beach cafes and restaurants come alive with colorful waiters, eccentric street people, stricken patients and everyday meetings that end up meaning a great deal. Her not-quite fashionable area of Potrero Hill comfortably houses Amanda, Blake and Indiana. Her far more seedy Tenderloin offers the backdrop for Indiana’s kindness and loyalty as a friend. Her Mission district is Amanda’s traditional, Catholic and paternal home base. Adjacent Marin county becomes an extraction point for ex-SEAL’s Ryan, Pedro (and Atilla). Having lived in San Francisco, I was able to visualize Allende’s settings with ease, but her deft and detailed imagery would appeal to any reader. Blake Jackson was not a superstitious man, but he suspected that the spirit of his late wife had somehow managed to pass to Amanda. Before she died, Marianne had told him that she would always watch over him, that she would help him find comfort in his loneliness. He had assumed she was referring to him marrying again, but in fact she was talking about Amanda. Truth be told, he’d had little time to grieve for the wife he loved so much – he spent the first months of widowhood feeding his granddaughter, putting her to bed, changing her diapers, bathing her, rocking her. This levelheaded grandfather was surprised to hear himself talking aloud to the ghost of his dead wife, asking what he could do with this impossible creature, and the answer arrived in the form of Elsa Dominguez, a Guatemalan immigrant sent to him by Bob’s mother, Dona Encarnacion Martin. As in her other books, Allende draws us into the most intimate details of family life — bathing, colic, rashes, pigsty messes in the kitchen — through her eccentric and transformative characters. I would have enjoyed even more of these scenes in the book, but at the same time they do abruptly change the fast paced tempo of the book and too many of these speed bumps would likely have been distracting. Ultimately, Amanda, Blake, the Rippers, Ryan, Atilla and Deputy Chief Martin solve the mystery. It has a few twists and turns and doesn’t necessarily wrap everything up in a neat bow. I kind of like that, and I kind of think we will meet Amanda again.